Normally being forced to walk an unnecessary U might annoy me, but not in the Cuzco airport, where the circuitous walkway is lined with plate glass windows that display the verdant Andean mountainsides, divided up by red dirt roads into blocks of homes, towns, and fields with a tidy precision normally only seen in Farmville. 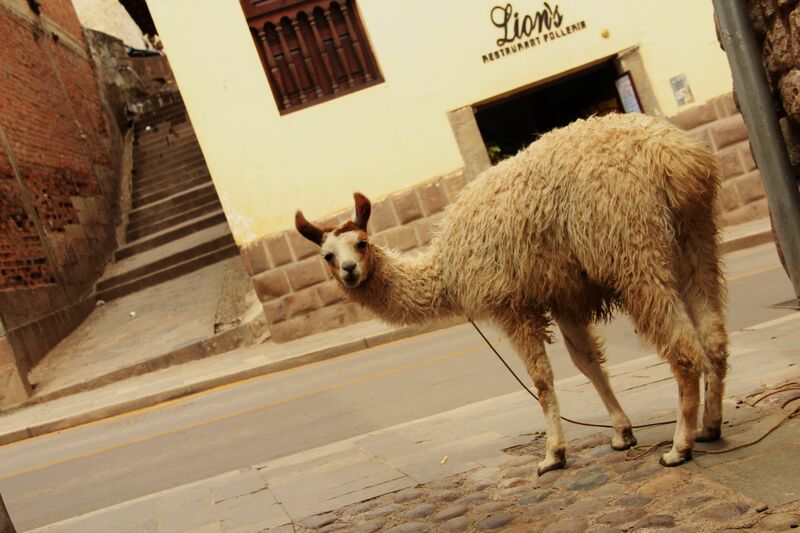 It’s Cuzco. Why would there NOT be a llama on the street? Atahualpa has lost a llama, can you help him find it? Everyone loves Cuzco, and with a view like that, I could see why. Literally. 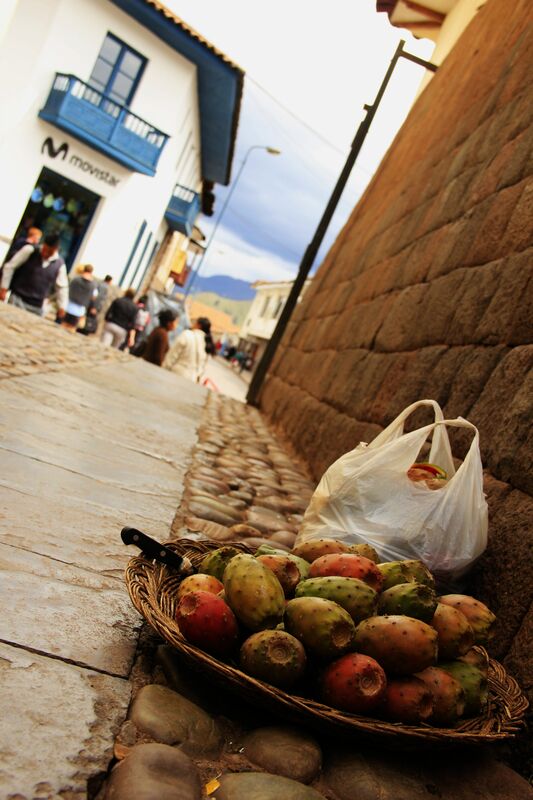 So I loved Cuzco, now it was time to make Cuzco love me. Problem: who are the first people you meet when you leave an airport? Taxi drivers. Not easy people to pal with, especially when you refuse to pay their tourist fare x2. But the taxista who accepted my fare chatted with me on the way in, warming, and was won over when I told him about the Brazilian fart monster that fumigated my room last night. In my experience most males love a good fart joke, and Latin American men even more than average thus far. Ha! I’d won over a taxista via a Brazilian’s digestive disorder. Victory! Almost worth the stench. The hostel staff were lovely (how did we end up talking about Nijmegen? ), and the people around town responded politely and kindly in every interaction, from the restaurant kid to the lady in a bowler hat who sold me two cactus fruits. Dang, Cuzco and I are on our honeymoon! “Masaje señor?” I habitually ignore offers made in tourist-saturated plazas, but while I waited for the incessant stream of cars to hiccup, she added “30 soles for one hour.” 30 soles is about ten bucks US. For an hour massage? Vamonos! The table was handmade, the face-hole an uneven gap that you reached through Xs cut in sheets, but I was a happy camper. The honeymoon continued. Except for one thing. When she pulled the sheet back to get to my lower back she saw my undies. Tired old backpacker skivvies, handwashed and wrung out a thousand times over the miles, fraying elastic and formless droop. Not great. Then she noted: “Te los pusiste al reves.” I was wearing them inside out. Face pushed into the hand-cut hole in the sheet, I explained to the ground that I caught an early flight this morning, so got ready at 5:00 in a dark bathroom. This excuse makes little sense, but she let it slide. Gracias, amiga. The writing says “I love so much”. Why yes. They had Enya on loop, so I watched The Fellowship of the Ring on inner Dvd, followed by a flashback to middle school for the courageous and terrifically awkward performance of Caribbean Blue by a girl in my 7th grade class at the talent show. So good, so awful. “If every man, says all he can, if every man were true” sang the 12 year old. I’ve only gotten a few professional massages, but if they were all $10, I’d be in there daily. It was lovely, and I came out so relaxed I’d kinda forgotten how to talk, so when they asked if it was okay, my answer was a sort of boneless jig, forearms flapping. I realized this may have been an odd response and turned to see how it was received. “Your fly is open” said the matron. I don’t know how to say “blush” in Spanish, but I know how to do it in Cuzco. ← Peru, why you no let me esleep? Hee Hee! Thank you, yet again!! I feel so blessed that you send all of your readers a gift of laughter and precious images. It is a gift not quickly forgotten. Travel on!!! Thank you Shirley! I’m so glad you enjoy the posts, I’ll keep ’em coming. 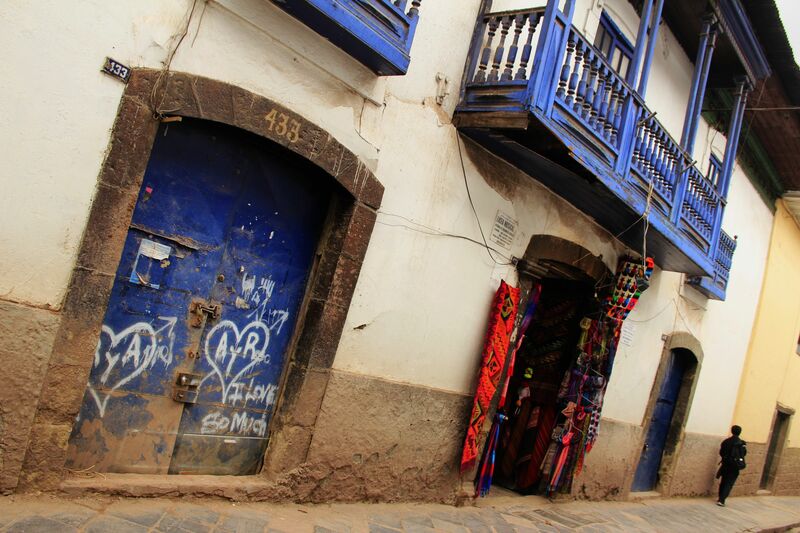 Cuzco has two walking tours. One is quite commercial, taking you to cafes and restaurants they hope you’ll visit later, but the Grand Cuzco Walking tour is excellent. And finishes with a pisco sour at the guide’s apartment. Do it if you can. They meet in the square about 12:30.